Earlier this year in March, Wenta and the btc held their first ever client Thank You Event, in collaboration with the Stevenage Borough Council. Due to the success of that event and in support of the national campaign, Small Business Saturday (2nd December), we’re bringing the event back by popular demand! The Thank You Events have been designed to do exactly as it says on the tin, thank clients for working with Wenta to help them set-up and grow their small businesses, utilising the support services, talking to advisors, renting work spaces, attending training and events. 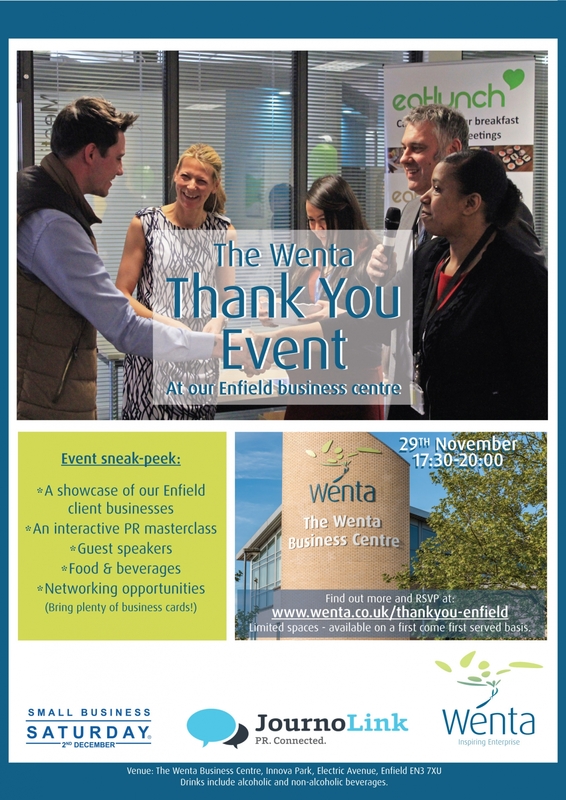 Set to take place on the evening of the 29th November from 5:30pm–8pm, at Wenta’s business centre in Enfield (Innova Park, Electric Avenue, EN3 7XU), the event will have a festive tone, showcasing a selection of local small businesses and Wenta client exhibitors. It’s completely free to attend and will be providing an exciting schedule including a PR masterclass run by Journolink, a ‘drop-in’ business advice clinic, networking with food and beverages, plus so much more! For further details on the event and to register your attendance, visit: www.wenta.co.uk/thankyou-enfield. Business advice clinic running throughout evening. Complimentary food buffet and refreshments served in the Main Foyer. •	Wenta is a not for profit organisation independently funded through the ownership and management of its three business centres in Enfield, Potters Bar and Watford and the management of the btc in Stevenage. These business centres comprise workshops and offices with a combined space of over 100,000 square feet, let on monthly licence terms to small businesses. Wenta, one of the leading Enterprise Agencies in the East of England and a social enterprise. •	The Wenta Business Centre - Enfield was renovated in 2013 to reflect a modern look and feel. The business centre ideally located on Innova Park and offers the full spectrum of business support services and facilities including; virtual office services, mailbox and call answering services; meeting and training room facilities; business advice - available onsite and online; onsite networking events and an onsite café. All our offices and workshops are let on an easy-in, easy-out monthly rental terms making it's easy for clients to move according to their business needs. There's also a shared workspace facility - ideal for those that are not quite ready for their own office. •	In 2016, the btc was awarded the ‘Enterprise Award’ for making a real difference to the local community at The Pride of Stevenage Awards. •	Journolink is an online tool enabling SMEs to manage their own PR affordably. The platform allows you to send press releases to over 6000 journalists, to receive editorial requests to your inbox, to access a business calendar with key dates and events and provide you with a PR toolkit to help you to enhance your PR strategy.